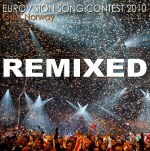 The ULTIMATE Eurovision Remix Collection as our “Thanks” to you! The Ultimate Eurovision Remix Playlists from 2010 to 2013! Eurovision Ireland would like to thank all of the people who have visited our website this year. We are almost at half a million views to our website and 130,000 hits on our YouTube videos that we have made. Not to forget the thousands of tweets and direct emails that we have received from literally all over the world. So we were thinking how we could thank you and like that our prayers were answered by one of our German followers! Yes our good friend “Eurovisionaer” from Germany just informed us that they had completed the most AMAZING playlist of remixes of the Eurovision song contests from 2010 to 2013. 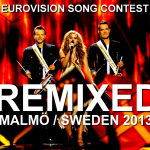 These are playlists of between 17 to 19 songs from each of the 4 Eurovision’s that they have remixed and included audio footage from the shows. It is almost like being back in the arenas over the years. These playlists are free on “Eurovisionaer’s” website and ideal for getting over your Post Eurovision Depression or Hosting a Eurovision get together with your friends or for working off those few extra pounds you put on eating all those Swedish Meatballs (and tasty they were). A wonderful collection of remixes from the Internet all placed into a playlist for you by Eurovisionaer! Thank you all for following Eurovision Ireland this year and stay tuned for exciting new features that we have coming your way for Eurovision 2014. Happy Father’s Day! Who’s Your Eurovision Daddy? thx a lot for posting this article about my annual dj-sets! Your website is fantastic and the remixes are great!